Sotherne (London & co. Salop). Granted 1628. Gu. on a bend ar. 3 eagles displ. sa. Crest = an eagle displ. with 2 heads per pale ar. and az. ducally crowned upon each head or. Motto: Alta peto. Sotheron (Kirklington & co. Nottingham). Settled in the east & west of co. York for more than two centuries. Admiral Frank Sotheron of Kirklington, eldest son of Wm. Sotheron Esq., of Darrington, left an only daughter and heir, Lucy Sarah. She married Thomas Sutton Bucknall Estacourt, Esq., who assumed the name and arms of Sotheron. Gu. on a bend indented between six crosses crosslet ar. 3 eaglets displ. sa. Crest = an eagle displ. with two heads per pale ar. and gu. wings semee of crosses corsslet counterchanged, murally crowned, beaked and membered or. Sotheron (Newcastle-on-Tyne). Granted 1561. Ar. a chev vert between 3 branches of sothernwood ppr. Sotheron (Holm-in-Spaldingmore, co. York). Gu. on a bend indented between six cross crosslets ar. Three eagles displ. sa. Crest = an eagle displ. with two heads per pale ar. and gu. semee of cross crosslets counterchanged, and ducally crowned upon each head or. Motto: Deo gratias. ARMS: Gules on a band indented between six crosses crosslet agent three eagles displayed sable. CREST: An eagle displayed with two heads per pale argent and gules wings semee of crosses crosslet counterchanged Murally crowned beaked and membered cr. AUTHORITY: Burkes General Armory, 1883 edition, page 949. The shield is of red. The band indented is of silver with the eagle thereon of black. The six cross crosslets are of silver. The two headed eagle is perpale, silver on the dexter side with red cross crosslets and red on the sinister side with silver cross crosslets. The Mural crown beaks and legs are of gold. The Wreath and mantle are of silver and red. The Esquire Helmet is of steel grey, lined in red. 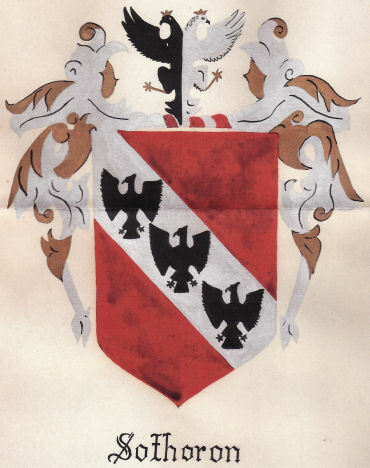 NOTES: Burke records the above Arms Crest as authentic for the family name Sothoron (Sotheron), who settled in the East and West of County York for more than two centuries. Admiral Frank Sothoron of Kirklington eldest Son of William Sothoron Esq. of Darrington left an only daughter and heir. Lucy married Thomas Suton Bucknell Estcourt Esq. who assumed the name and Arms of Sothoron. Coat of Arms that was in the possession of my grandmother, Linnia Katherine Haddox Sothoron. Accompanying papers cite the same source as for the one above. Coat of Arms provided by Alyson Sothoron; it's origin is unknown. Arms of Sotherne of London and Shropshire.